Comprehensive review of Karora Tinted Self Tan Mist. See what real experts and actual users have to say about this self tanning product. After trying Karora Tinted Self Tan Mist, I gave it 2.5 out of 5 stars. So overall, I found it to be an average self tanner. Let me start out with the one thing I really liked about this mist. The color is great. It’s a medium to dark shade and it looks extremely natural. It was even and streak free, which was nice. I really was impressed with the color it gave me, but I don’t think the color outweighs the negatives of this one. The smell is very bad. It smells like chemicals, and since it’s a mist I couldn’t help but inhale some product while applying it. Application is also very exhausting and tedious due to it being a mist you have to spray onto a mitt. The price is higher than average, and I think it’s a big high to pay for just an average self tanner. So, in conclusion, I think that this is a pretty middle of the road self tanner so I gave it 2.5 out of 5 stars. Karora Tinted Self Tan Mist is a mist with a pump spray. It’s not a continuous aerosol spray, so it requires more effort to apply. The name implies that this product had a guide, but it really doesn’t. When I sprayed the product onto my mitt it had a slight grey color. Once I started blending into my skin, that color went away completely and I saw no guide at all on my skin. So the name of this product is pretty misleading. Especially if you buy it for the sole reason of it having a “tint” to it. This mist was pretty tedious to apply. The directions say to spray onto a mitt and then blend into your skin. Since this is a mist and not an aerosol, I had to pump quite a bit of product onto the mitt and it became very tiresome. The mist itself is very fine, so I felt like I needed even more product that I’d use with your average self tanning mist. Like I mentioned earlier, there is no guide to see where you’re applying the product. I’d also recommend applying this one in your shower so you can just rinse away any residue that falls to the ground. A few minutes after applying this one I felt very sticky. The stickiness faded after about 15 minutes and I found the product dried completely in about 30 minutes. So it’s not the worst for drying times, but not the best ever. It’s pretty average as far as drying times go. This mist doesn’t smell very good. It smells like cheap chemicals to me. I could also smell DHA when applying it. The scent overwhelmed my shower (where I applied the product). I couldn’t wait to be done applying it! This one failed in the scent department. I smelled really gross as this self tanner developed. I could still smell chemicals, but I really smelled like DHA! It was nasty. By the next morning, I was so sick of the smell I couldn’t wait to wash it off. Karora Tinted Self Tan Mist gave me a medium to dark shade tan that was very even. I actually really like the look of my tan, and felt great wearing it out. I used the Medium/Dark shade, and the color produces is true to it’s name. I think a lot of you out there will like the color it produces. This mist lasted 4-5 days before it was gone. And it got SO patchy as it faded, I was completely shocked by how bad it looked. I tried to scrub it off a few times in the shower because it was so splotchy. The color is very nice, but the smell is bad and the application process is a pain. Karora Tinted Self Tan Mist is only $8.88 per ounce which is pretty expensive. But the entire bottle retails for $30 which isn’t so bad. 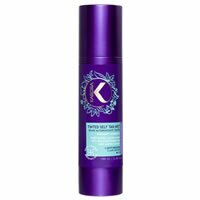 To buy Karora Tinted Self Tan Mist, Click Here. Look and Feel This is a mist with a light grey color, but no color guide. Application Applying is tedious because the mist is so fine. Drying Time It dried in about 30 minutes total. Smell (Before) Smells bad, like chemicals and DHA. Smell (After) Still smelled bad the next morning. Color Produced My tan was a medium to dark shade that was very even. How Long It Lasts It lasted 4-5 days and then became so splotchy and uneven. Price It’s $8.88 per ounce which is on the pricier side.